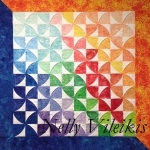 Using her award winning quilts as examples, Nelly explores how to deal with all kinds of quilts, from applique and traditional quilts to pieced and modern ones. Walk away with many design ideas, how to combine background fillers and more. Learn about registration marks and minimal marking for a speedy and efficient process. Working on paper mock-quilts, experience the process of design selection, ways to proceed in a variety of situations. 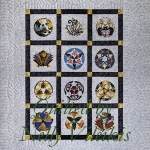 In addition, you will learn to deal with troublesome borders and many other tricky situations that arise on real quilts — whether they are yours or your customers’. Drawing class. Friday, April 01, 2016 – 6:00 PM-9:00 PM ALMOST FULL SOLD OUT!!!!!! You’re going to LOVE curves! See just how to execute one of Nelly’s favorite quiltmaking techniques – the one she uses to create curves without sewing any – and then experience it yourself. You’ll use it over and over as you assemble this tessellating design, which is actually constructed using squares – and only squares. Explore how to create dynamic movement with color choices, and discuss finishing options for a glorious quilt. Bring your own fabric: see supply list for details. In the Pfaff Studio sponsored by Pins & Needles. 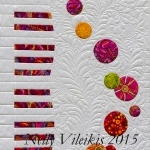 Learn some of Nelly’s graceful free-formed feathers and how to adjust them to fill in spaces that commonly appear in quilts. You will learn to work a feather into a tight or very open space, and gather some ideas for backgrounds to complement the feathers and transform a simple quilt into a spectacular one. Drawing class.